Barack Obama's UK visit: Where did past presidents go? Barack Obama and his wife Michelle will visit the UK on their first official state visit in May. 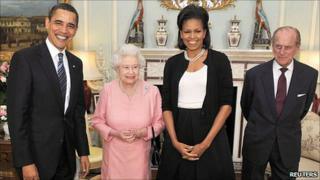 US presidents who have met the Queen have mostly stayed in London, but where else in the UK might the Obamas travel? The Obamas' planned visit to the UK in May is their second trip to the country, but the first as official guests of the British Royal Family. Since the turn of the 20th Century, 11 American presidents have made the trip across the Atlantic. Most have stayed in London, visiting Buckingham Palace, Downing Street and other sights on the diplomatic tourist trail. Some presidents have ventured further afield to get a more varied taste of Britain. If Mr Obama was looking for ideas on where to visit outside London, he might take inspiration from Woodrow Wilson, who was the first US president to travel to the UK as a guest of the Royal Family in December 1918. During the visit he took in not only London, but Manchester and Carlisle. His trip to the latter was a personal one which was described as a "pilgrimage of the heart". He boarded the royal train from London to visit his mother's birthplace, and the church where his grandfather preached. "He wanted to take time off on his way to a peace conference," says Andrew Wilson, the author of a book about the president's ties to the area. "It was all done very quickly and very quietly," he adds. "Nobody expected him to do this." The president had a deep affection for the Lake District as a whole, having visited the area four times before taking office. On his first trip in 1896 he cycled from Glasgow to the area. President Wilson's ties are evident to this day in Carlisle. A plaque commemorating his visit is on the side of his grandfather's church and a Woodrow Wilson tourist trail has been set up in his honour. There is also a pub named after him - somewhere Mr Obama might get a taste of real English ale if he decided to visit. If President Obama chooses to emulate Wilson's "pilgrimage of the heart", he might consider a trip to Bracknell. A short train ride from London, the commuter town might not be an obvious choice for a world leader, but Mr Obama has already made a trip to the area. Before he became president he attended his former brother-in-law's stag do in nearby Wokingham. Mr Obama's half sister Auma used to live in Bracknell, and it is thought his step mother Kezia still does. If the Obamas decide to journey further afield, Scotland could be another option. President Dwight Eisenhower visited Ayrshire in 1959. After spending time in London, Chequers (the prime minister's official residence in Buckinghamshire), and at Balmoral (the Queen's residence in Aberdeenshire), he ventured to Culzean Castle in Scotland. Now a visitor attraction, the castle was the seat of one of Scotland's oldest families, the Kennedys, who trace their ancestry to Robert the Bruce. President Eisenhower - who was supreme commander of Allied forces in Europe during World War II - spent time at the residence on a number of occasions. During his visit to the UK in 1959 he rested there before returning home to America. He was even given a specially created guest flat on the top floor of the castle, as a "gesture of Scottish thanks for America's support during World War II". Other trips made by US presidents have also marked military co-operation between the two nations. In 1945 President Harry Truman visited the naval city of Plymouth. There, he was received by King George VI on the battle cruiser HMS Renown, before sailing back to the US on the cruiser Augusta. In 1969 President Richard Nixon visited RAF Mildenhall in Suffolk, home to thousands of members of the US Air Force. In more recent times, Bill Clinton visited the naval city of Portsmouth for the D-Day commemorations, while in 2001 George W Bush made a trip to the Royal Air Force base at Brize Norton. Then there are trips with political undertones, such as that made by Mr Clinton to Northern Ireland. It doesn't all have to be about work though. For George W Bush, leaving London meant a chance to have a pub lunch with Tony Blair during a four-day visit in 2003. The pair visited the Dun Cow Inn in Mr Blair's constituency of Sedgefield, where they tucked into leek and potato soup and fish and chips with mushy peas, washed down with non-alcoholic lager for Mr Bush and soft drinks for Mrs Bush and the Blairs. A meeting in more casual surrounds was also enjoyed by the Kennedys during their visit. They travelled out of London to Birch Grove in Sussex, the private residence of Prime Minister Harold Macmillan. It was reported that President Kennedy wanted to see some of the British countryside so chose to spend a night there. As part of his visit he attended the Sunday service at a local Catholic church, the Chapel of Our Lady of the Forest, where he was greeted by crowds of admirers as well as protesters. There is a chance that this personal hospitality could be extended to the Obamas by David Cameron. The prime minister's home in Witney, Oxfordshire, is surrounded by a good representation of the British countryside his predecessor craved, and near enough to London for a day trip if time is limited. For some presidents, a trip outside London hasn't been motivated by politics, friendship or family, but charity. Jimmy Carter took a trip to Newcastle in 1977, reportedly because his wife's charity had built links with the city and conducted exchange visits with Atlanta, the capital of Mr Carter's home state. In an effort to bond with the locals Mr Carter greeted the assembled crowds by shouting "Howay the lads". It's reported that he came out with the greeting having seen a billboard reading "Howay Jimmy". During the four-hour visit, thousands packed the city's streets to greet him. The president was conferred the Freedom of the City during his trip. "I am very grateful to be a Geordie now," he told the crowd. If Mr Obama wanted a similar twin city experience he might consider visiting Birmingham, the Midlands city that Chicago is twinned with. There he could even follow in Bill Clinton's footsteps and sample a traditional balti on the city's curry mile.